The distance of the Large Magellanic Coud, the closest satellite galaxy to the Milky Way, has been determined with a heretofore unequaled and formal accuracy of 1 %. The fruit of work carried out for over 20 years, this outstanding result, to which have contributed scientists from the Côte d’Azur Observatory has been published as a letter to Nature, dated March 14th 2019. The Large Magellanic Cloud (LMC) is a reference point for the calibration of the cosmic distance scale. For the first ever time, the international team of the Araucaria project has determined the distance of the Large Magellanic Cloud to an accuracy of 1%. 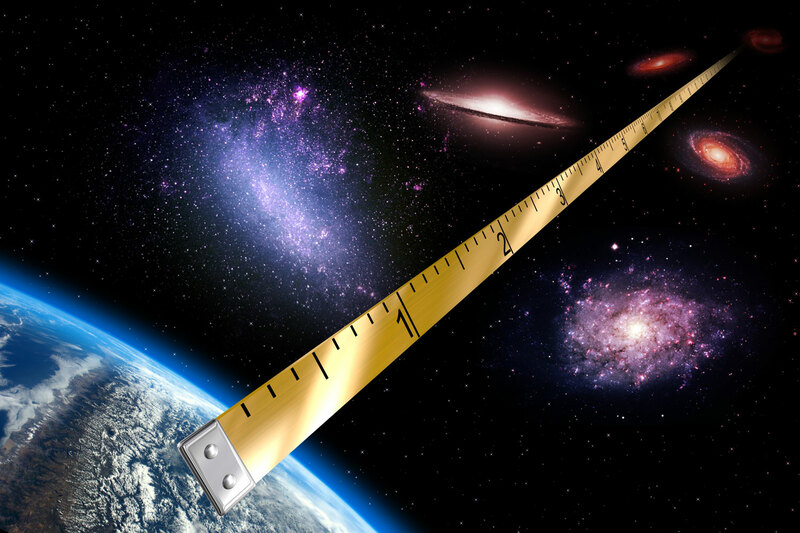 This accuracy is comparable to that which one can obtain when measuring the size of a human being, with just the difference that in the case of the LM the distance which is measured corresponds to 162 000 light years, i.e. 1 530 000 000 000 000 000 km. One cannot underestimate the importance of this work which, step by step, leads to the determination of the Hubble constant, a fundamental cosmological quantity which describes the rate of expansion of the Universe. The Large Magellanic Cloud houses a large number of Cepheides, particularly bright pulsating stars. The particularity of these super giant stars is that their intrinsic brightness is related to the period of their variability: the variability of Cepheides is such that their brightness is in direct relation with their period, and obey the Leavitt law. This law was discovered by the American astronomer Henrietta Leavitt in 1908 through a study of the Cepheides in the Large Magellanic Cloud, in which over 4000 Cepheides have been recognized to date. Applied to the Cepheides detected in distant galaxies, the Leavitt law has enables us to calibrate the intrinsic brightness of a secondary distance indicator, thus enabling one to reach even farther: Type1a ou SN1a supernovae. These stellar explosions are rare but extremely bright, and are thus detectable at the very large distances of many thousands of light years. In their search for SN1a supernovae, astronomers map the Universe and can determine its rate of expansion, encapsulated in the Hubble constant H0. Thanks to these increasingly better distance measurements, one can now study more tricky problems of modern cosmology: the nature of dark energy. One can find in the literature hundreds of estimates of the distance of the Large Magellanic Cloud, based on a large number of different distance indicators, including Cepheids. However, each method is associated with specific biases. The scientists in the international project Araucaria have studied the bright eclipsing stars in the Large Magellanic Cloud. 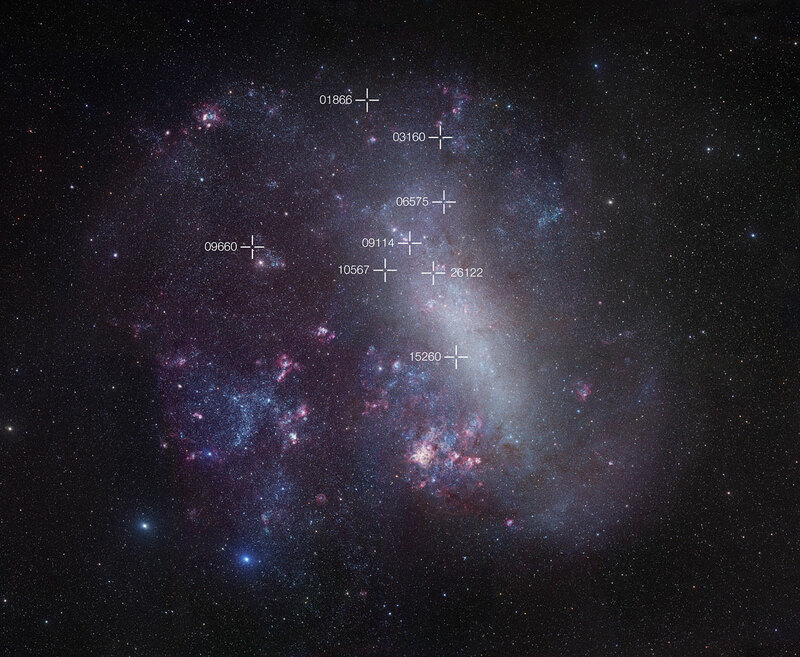 Map of the Large Magellanic Cloud. 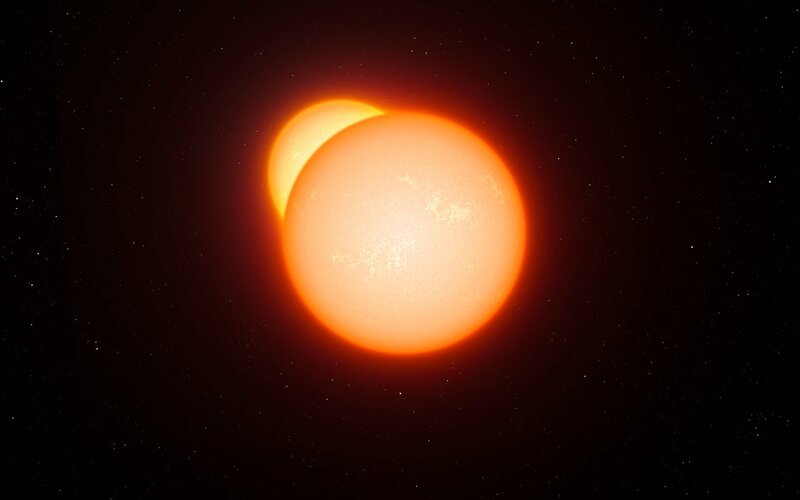 These exceptional bodies are made up of two stars turning around their barycenter: they eclipse each other at regular intervals. Artist’s view of an eclipsing binary. The variations in the light received during eclipses, associated with changes in the speed of each of the two stars, enables one to determine very accurately their linear diameters. 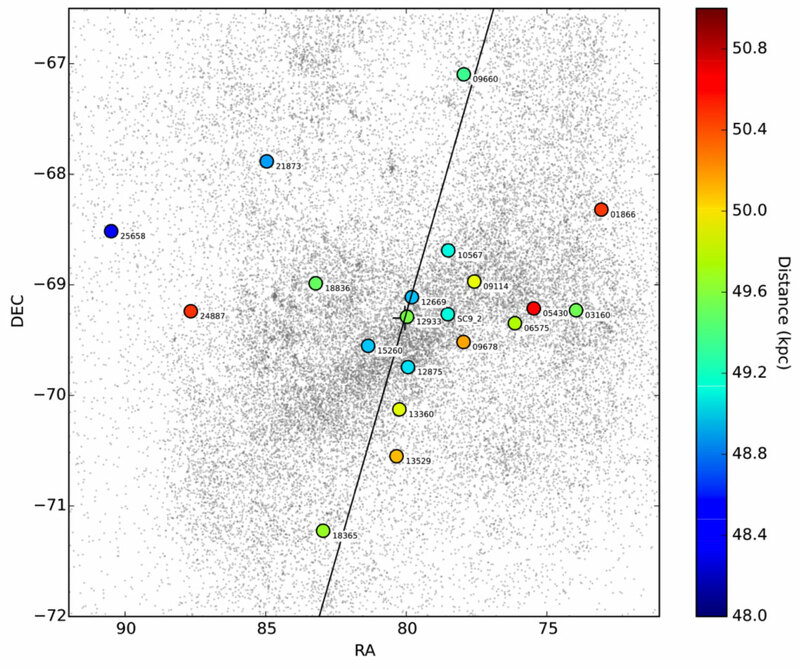 Figure showing the 20 ecllipsing binaries detected in the Large Magellanic Cloud. Thanks to an accurate determination of the distance of these 20 eclipsing binaries, the distance of the LMC has been determined to an accuracy of 1 %. One also uses the fact that these stars emit light according to a very well determined law relating the temperature, or color of the star, its apparent magnitude and its angular diameter (its apparent size). Combining the estimate of the linear diameter of these two stars of the eclipsing binary with the estimate of their angular diameters allows to obtain an accurate determination of the distance. This method is however difficult to apply in practice, since the eclipsing binaries targeted in this study are "cold" bodies which radiate relatively little light. Thus, the team of the Araucaria project has followed almost 35 million stars in the LMC for over 20 years. Out of these 35 million objects, only 20 eclipsing binaries were carefully selected, and followed with the help of large telescopes for over 15 years. Figure showing the 20 eclipsing binaries detected in the Large Magellanic Cloud. By combining the estimated distance of these 20 eclipsing binaries, the team has found that the distance of the LMC is 162 000 light years, i.e. 1 530 000 000 000 000 000 km (1,53 billlion billion km) with a heretofore unequaled accuracy of 1 %. This is the first time that the distance of a galaxy has been determined with such precision. Thus, this result furnishes the best absolute reference for extragalactic distances, and thus for the determination of the Hubble constant, currently the subject of a controversy. This determination is also an essential ingredient to better understand the nature of the mysterious dark energy. Thee will be other consequences of this result, such as a better understanding of of all the types of celestial object within the LMC, s well as the calibration and validation of other types of distance measurement, such as, for example, parallax measurements made by the European Space Agency’s (ESA’s) atellite aia. The French contribution o this result was critical, and is the result of expertise in long distance optical interferometry. Such a high precision could only have been obtained thanks to a new calibration of the relation between the color of a star, its apparent magnitude and its angular diameter. This was done using the French instrument PIONIER installed at the focus of the large European optical interferometer of the European Southern Observatory (ESO), the Very Large Telescope Interferometer (VLTI) installed in northern Chile. French teams are unrivaled at an international level in the domain of the design, development and use of interferometric instruments. This research work has been published as a letter to ature dated March 14th 2019, entitled "A distance to the Large Magellanic Cloud that is precise to one per cent"
The research had the support of the Agence Nationale de la Recherche (ANR, project UnlockCepheids) and also of the Conseil Européen de la Recherche (ERC, project CepBin). Membre du projet ANR UnlockCepheids. Responsable du projet ANR UnlockCepheids.